As I write and re-write this blog, I don’t know where to start! I have experienced and learnt so much already it is hard to choose ‘the best bits’ to avoid writing a novel of what I have seen and done so far. My first elective location is Nepal. I left New Zealand a few days after exams as I was desperate to catch the end of the trekking season and find my way to Everest Base Camp. I couldn’t have asked for a better introduction to this absolutely beautiful country both scenically and culturally! The trek to Base Camp starts in a place called Lukla, which has very strong ties to New Zealand due to the enormous and inspiring work achieved here by Sir Edmund Hillary. In these parts, they call Sir Ed “God Father” and you can’t help but feel proud to be a New Zealander as kids ran past on their way home from Khumjung School – one of the many achievements of Sir Ed in this area. Rural Nepal is certainly a contrast to the chaos, dust and noise that is Kathmandu – home to over 3/4 of Nepal’s 36 million-odd population. There are no cars or motorbikes to be seen in rural Nepal, instead these are replaced by porters, donkeys, Dzo (yak crossed with a cow) and at higher altitudes yaks navigating the winding, rocky and steep trails. 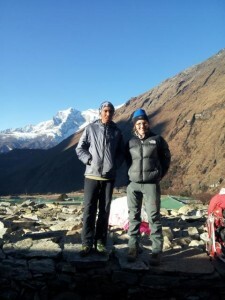 Natalia Irving with a local Sherpa who has summited Everest 8 times and had 15 attempts. Seeing the porters on these trails was perhaps one of the most humbling experiences I have ever had. As I huffed and puffed my way up the hills with only a 5-6kg back-pack on, I would give way to porters carrying up to 90kg of beer, juice, plywood, planks or other food items on their back, to villages at higher altitudes. For their efforts, they get paid 30 Rupee per kg (about 40c NZ) on the way up only (which can take up to 5 days) – this is an average wage here. Some porters are as young as 11 years to well over 70 years of age, often wearing nothing but plastic sandals in near freezing temperatures, I even saw one with prosthetic legs. However, they are thankful for the extensive tourism which means they have a job and income to feed their families with many of the communities thriving well with locals running tea-houses, shops and food stalls well patronized by hungry and cold trekkers. To my surprise, the trek became quite a medical experience and I was certainly pleased numerous times for the experience and exposure I had had this year at various rural GPs in Masterton! Due to having some medical knowledge, I was often asked for advice during the trek including diagnosis and treatment of a UTI, gastroenteritis and cellulitis. While this was quite scary at first, knowing I was not yet fully qualified to be giving such advice, I tried to remind myself that I had seen these things numerous times over the last year and with no doctor within km’s and km’s they were very appreciative to have some medical guidance. 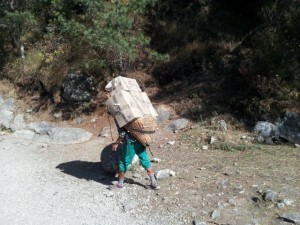 Local Sherpas carry extraordinary loads up the mountain trails seemingly with ease. The altitude also provided fascinating experiences. On the way up resting heart rates climbed and blood oxygen saturations drop. The day before Base Camp at 5100m my resting pulse rate was in the late 80′s-90 (usually 50-60 beats per minute) and blood oxygen 82% (normally 99-100%) – no wonder everything felt like such an effort!! Altitude sickness is a common occurrence on these treks and it keeps the helicopter pilots busily buzzing overhead. We lost one soldier to acute mountain sickness (AMS) the day before base-camp at about 5100m, with severe headaches, puffiness around the eyes, loss of appetite and a bleeding nose. The only treatment is to head back down to lower altitudes quickly as if left it can lead to cerebral oedema and death at its most severe form. It is not uncommon to see trekkers being supported by porters down the mountain or lying in tea houses on oxygen waiting to be airlifted out the following day to receive medical care further down the mountain. After saying goodby to this incredible part of the world my next stop and home for the coming weeks is Pokhara. Pokhara is about 200km West and slightly north of Kathmandu. Although the only 200km away the bus ride takes 7.5-8hours as we bump along the poorly maintained and windy road. However, I am so please I took this journey, although long, the scenery is truly stunning as the dusty streets and chaotic atmosphere of Kathmandu are replaced by banana trees and wheat fields which are currently in harvest with people making huge hay stacks and beating the immaculate piles of cut wheat to remove the wheat grains for drying on their roof tops. Pokhara moves at a much slower pace than Kathmandu and the Lake, Phewa Tal, is a beautiful focal point of this area. I am looking forward to discovering some excellent mountain biking and running tracks in the surrounding hills which I am told by the owner of the B&B where I am staying, provide spectacular views on a good day. I have now had a few days at Green Pastures Hospital and Rehabilitation Centre (GPHRC), the hospital where I am stationed for the coming weeks. It is run by INF (International Nepal Fellowship), a Christian NGO. It has been operating since 1957, providing free care to Leprosy patients in Western Nepal. It also provides rehabilitation services for spinal cord injuries, post stroke disability, cerebral palsy, orthopedic deformities such as club feet, amputations and some septic and orthopedic surgery. The team consists of 3 doctors, nurses, occupational therapists, physio’s and prosthesis and orthotic technicians. I have arrived at an interesting time for GPHRC. It has been experiencing hardship with funding and has had to reduce bed numbers from just over 70 to 45 beds of which 20 are dedicated leprosy beds. Due to the stigma carried by leprosy, patients do not want to come to this hospital to be treated for other conditions managed by the hospital mentioned above. Smaller patient numbers means reduced funding and the hospital is currently looking to re-orientate and almost ‘rebrand’ as a hospital which provides neuropathic foot care. 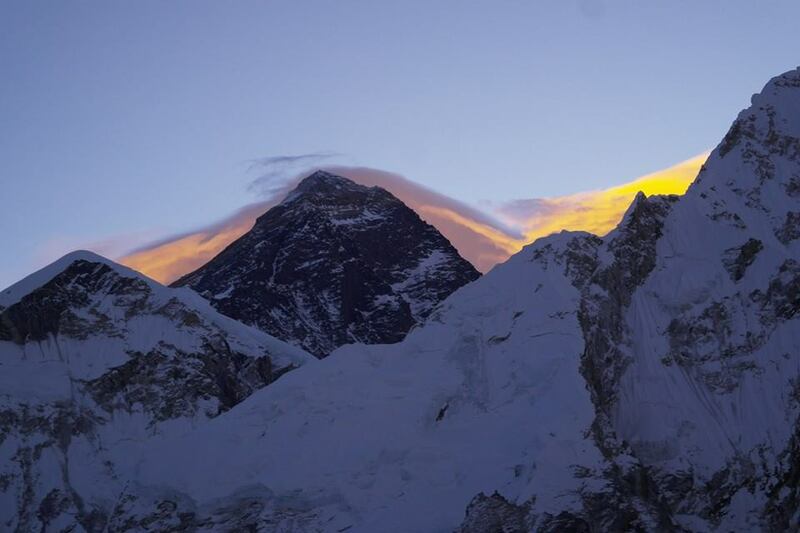 Mt Everest from that top of Kalar Pathar (5550m). As luck would have it, I am staying at the same accommodation as an American podiatrist who is working at GPHRC over 10 weeks to help them expand their service provision to diabetic patients. Diabetes is an increasing issue in Nepal as their diets move from traditional to more Westernised diets, containing high amounts of processed foods and refined sugars (one only has to look at the number of fizzy bottles, lolly, chip and processed food wrappers littering the streets and waterways to realise this is going to be a huge problem for this country in the future). Diabetics and Leprosy patients suffer similar issues with foot care as both diseases result in a polyneuropathy, causing loss of sensation and consequently trauma and ulceration. He has currently built a podiatry chair from an old wheelchair for examination and is funding an orthotics press to allow the hospital to fit orthotics to reduce the chances of these patients developing ulcers. Educating and training the technicians, nurses and doctors how to use this new technology is an integral part of the process. It has been interesting to watch this teaching unfold. While the doctors and nurses speak great english and are eager to learn and please, it is clear language and communication barriers still exist which is likely to make this teaching process a ‘marathon’ rather than a ‘sprint’. Further, a proper podiatry examination requires exposure of the knees and umbilicus to measure leg length which is culturally unacceptable for older generation Nepali women meaning the examination techniques have to be adjusted to take this in to account. It is going to be fascinating to watch this new 2014 technology be implemented in replacement of 1950′s or earlier technology in this poorly resourced hospital. And as I am plunged in to darkness by one of many numerous random power cuts in Nepal, I will sign off there for my first blog. I am looking forward to writing my next blog shortly. I am also hoping to head out in to the rural community for their prosthesis outreach services to patients who are unable to make it to the hospital. I will keep you posted! The Pat Farry Rural Health Education Trust can accept donations to support its work via Givealittle, an online fundraising service for charitable trusts and causes such us. Givealittle charges zero fees so the Trust will receive 100% of your donation. Givealittle will send a donation tax receipt to you when you donate. Wonderful update Nats. Great to hear your trip is going so well and that you are learning a lot.